Armita Raafat recently returned to Chicago after spending a few months in Iran. While there, she researched architectural ornamentation on mosques in Isfahan, a city known for its resplendent Islamic landmarks and Persian tapestries, in preparation for her first solo museum show, at the Museum of Contemporary Art. In a gallery on the museum’s first floor, Armita has effectively transposed the distinctly Islamic decoration to the distinctly bland white-cube exhibition space. The wall sculpture conflates two (or more) cultures by way of their artistic achievements—a thicket of visual information on one hand and a fiction of asceticism on the other, here tensely vying for surface dominance. Armita’s method is to destroy while she creates. In order to build a ruin, she must assemble plaster fragments while cracking their edges, apply raw powdered pigments while deliberately spilling them and break things in a calculated way. Her inspiration is muqarnas, an Islamic decorative motif resembling an intricate honeycomb, found in mosque domes and known for its geometric complexities. Here, it spreads along the white wall like a blister, or else it is sinking behind the wall’s rising flatness. Either way, there is movement, and both elements are equal, especially as small mirrors embedded in the sculpture reflect, and thereby contain, other parts of the museum’s architecture, such as its iconic staircase. While citing Shirin Neshat for successfully giving exposure to Iranian society, Armita feels that too much is currently made of the East versus West divide, as described by such identity art of the 1990s. Instead, she hopes that her objects can be read along broad cross-cultural lines, for many people have experiences with war-torn cities. In 2008, she was commissioned to create a similar piece for an exhibition about Israeli-Palestinian relations. However, if her pieces are going to be read in a specifically Iranian light, she prefers that viewers understand them as a celebration of the continuum of survival. Armita was born in Chicago and then moved to her parents’ native country in the 1980s amid the Iran-Iraq war. 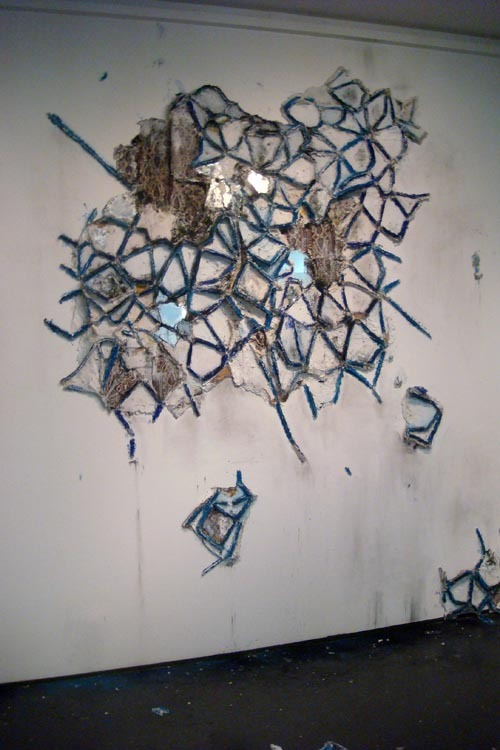 Several years ago she returned to Chicago to attend art school, and often travels to Tehran to see her family, and obtain art supplies for her installations. The turquoise pigment, and “another blue powder I don’t know the name of in English,” are less expensively obtained in Iran. Combined with turmeric in her sculptures, a palette emerges that is reminiscent of home, although Armita dislikes calling it homesickness. Laid atop stucco white, the admixture forms a sculptural solid identity for which there is not an adequate word in either tongue.